Idaho is coming off one of its worst fire seasons, with 1,151 wildfires tallied and a nation-leading 1.7 million acres, or 2,600 square miles, burned in 2012. BOISE – Two small but unseasonably early fires burning in northern California’s wine country and another wind-whipped blaze farther south likely are harbingers of a nasty summer fire season across the West. Officials with the National Interagency Fire Center in Boise said Wednesday in their first 2013 summer fire outlook that a dry winter and expected warming trend mean the potential for significant fire activity will be above normal on the West Coast, in the Southwest, and in portions of Idaho and Montana. If that sounds familiar to the region’s residents, it should. In 2012, record-setting fires raged in New Mexico and Oregon, while destructive Colorado blazes torched hundreds of homes amid one of the state’s worst seasons in years. Outside the West, however, much of the U.S. is expected to experience normal fire conditions, with below-normal danger in the South where significant, long-duration rains have saturated the landscape since Jan. 1, Delgado said. In California, wine-producing Napa and Sonoma counties experienced early-season blazes Wednesday, as warm temperatures, low humidity and gusting winds through already-dry foothills areas east and north of San Francisco led to warnings of extreme wildfire conditions. Evacuations were ordered for residences on two streets, but the number of people was not immediately known. A KCAL-TV helicopter showed at least one structure engulfed by flames. The culprit behind a California fire season that’s a month ahead of schedule? A winter where only 40 percent of normal precipitation fell and a scant spring rain that typically greens up hillsides and pushes fires back into summer. 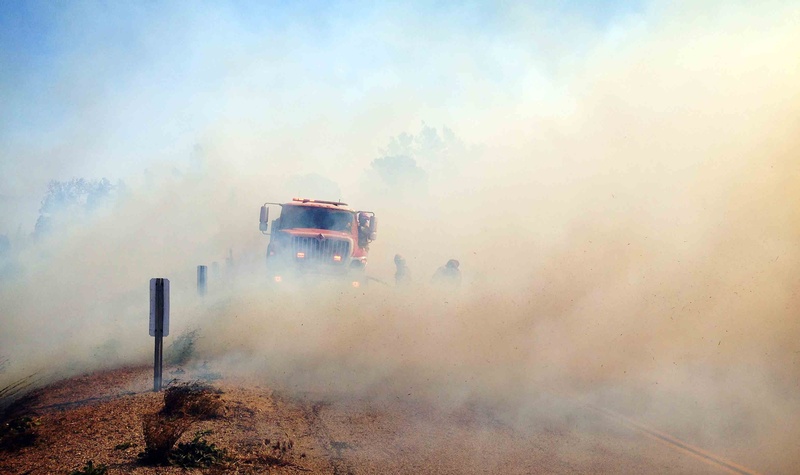 In Arizona, a nearly square-mile wildfire near the Chino Valley had state forestry officials busy Tuesday, as the fire rolled through grass and brush. The National Interagency Fire Center says there’s likely more to come across the Southwest. “Above normal significant fire potential will develop across much of the southern halves of New Mexico and Arizona in May,” the report concluded. “Warmer and drier conditions beginning in June will quickly elevate significant wildland fire potential to above normal across southern and eastern Oregon and portions of south-central and southeastern Washington,” the fire center said. Idaho is also coming off one of its worst fire seasons in 2012, with 1,151 wildfires tallied and a nation-leading 1.7 million acres, or 2,600 square miles, burned. The same goes for southeastern Oregon’s open ranching country, where massive range fires last year torched great swaths of ground, including the state’s biggest blaze in a century, July’s Long Draw fire.